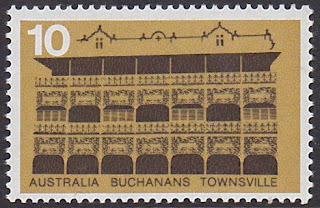 Flicking through my collection this week searching for stamps featuring architecture, the theme of this weeks Sunday Stamps, I was slighty dismayed about the disproportionate number of horse-racing stamps Australia has issued over the years compared to stamps on architecture. Even for a sporting nation such as ours, I was surprised to see so many horse stamps. Although I should hardly be shocked, given I live in a city that has a public holiday for a horse race: on the First Tuesday in November for Melbourne Cup, aka 'the race that stops the nation'. 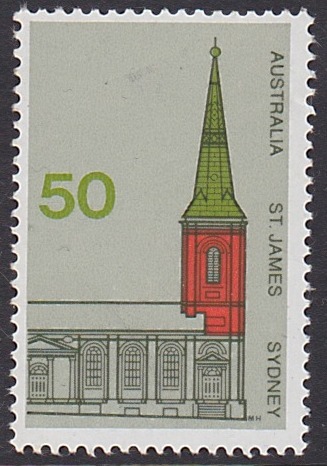 Anyhow, Australian stamps make up the heart and soul of my collection, and I so I desperately wanted to be able to showcase some Australian architecture for Sunday Stamps, but for a moment I thought Australia Post was going to let me down. Then I went back to Grandma Nellie's stamp collection and found these gems from the 70s. The stamps were issued in October 1973. 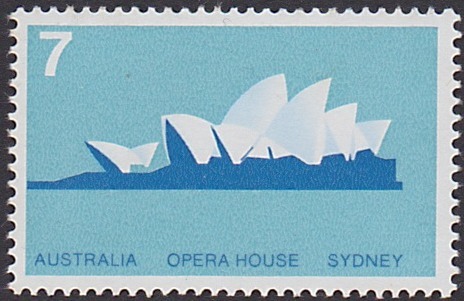 The Sydney Opera House is an obvious choice for an Australian Architecture stamp, and the blue 7c issue was the standard postal rate at that time. 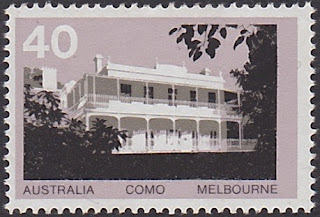 Melbourne is represented on the 40c stamp by Como House, which is a National Trust owned property, and is a gorgeous relic of a bygone era now surrounded by the bustling inner suburbs of the metropolis. We had a gorgeous 'high tea' there for my sister's hens a few years ago, an appropriately special place for a special occasion. I don't really know anything about Buchanans in Townsville, or St. James Church in Sydney. What I do know is that these stamps are another example of the bold simplicity of 1970s Australian stamp design which really floats my boat. When perusing my Stamps of Australia catalogue, which I purchased last week, I found that Australia has in fact celebrated architectural design in another set of stamps showcasing landmarks of Modern Australian Architecture in 2007. That makes two architectural issues versus what I count as five horse-racing or horse-racing-related issues! 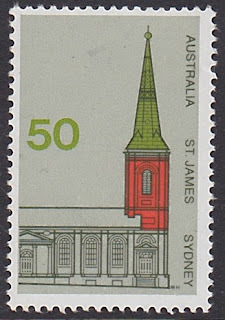 The sculptural form of the architecture is highlighted through the black and white photography featuring on the stamps. Like the block-cut prints of the 70s, this simplifies the elements of the buildings in order to really showcase the architecture. I like this 2007 set so much that I just bought it on ebay! 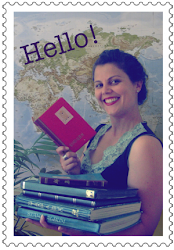 This is an entry for Viridian's Sunday Stamps. I guess we would all recognise the Sydney Opera House but not the others. Great to see them. You've found a great variety of styles, despite the horse racing:-) Como House is a rather lovely building, difficult to imagine those peaceful pictures as being in the middle of a city. I had no idea horse racing was such a big thing in Australia. 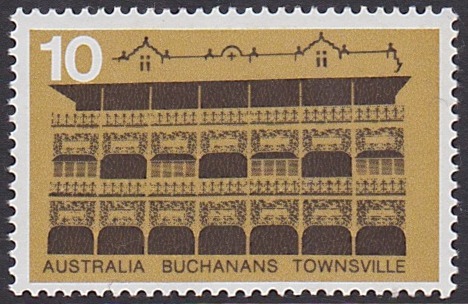 I must say I prefer the architecture stamps, especially Buchanans in Townsville which looks very attractive. I think Buchanans is a hotel. But I have never been to Townsville. It does look pretty nice though! I like the black and white sheet you showed at the end. I feel like I am encouraging my Sunday Stamp participants to fritter away their hard earned money on stamps but i should remember it is your choice. thanks for joining inthis week and hope to see you in the future! 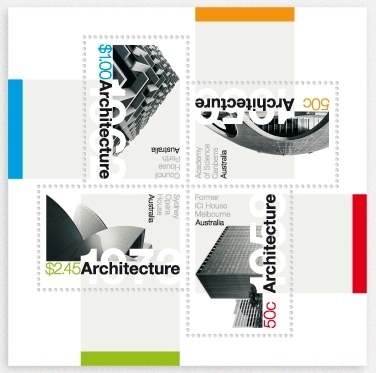 I like the simple designs of the architecture stamps. I didn't know horse racing was so popular in Australia. The 2007 set is definitely one that entices you to buy it. I think the architecture of Australia should be celebrated more!